Sports marketer Stefanie Gordon was lucky enough to score a row of three empty seats on a flight from NYC to Palm Beach, and even luckier to look out of the window at the captain's prompting and capture the above photo. It's the Space Shuttle Endeavor making its final launch. The times being what they are, Gordon Tweeted the photo from the ground and is now getting her fifteen minutes. NASA and every news organization you can think of re-tweeted the photo and news show appearance requests have been pouring in. Gordon's Twitter followers shot from roughly 1,800 to the 4,000 range, and she's been quick to capitalize on the boost: "Anyone want to hire me???" Gordon tweeted, with the hashtag "#worldfamousiphonephotographer." Jeez Louise. Correction: Second to last Shuttle launch. 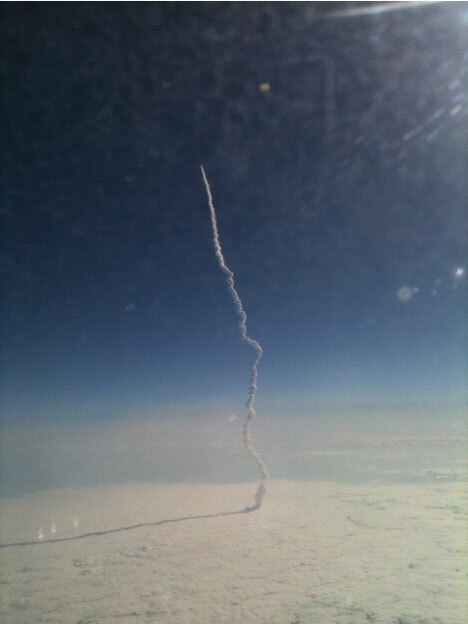 This was only Endeavor's final launch. You might want to edit the title. This is the last launch for Endeavour, mission STS134, not the last launch overall. There is one more mission scheduled: STS135, which will be the final flight for Shuttle Atlantis.